Warm Cauliflower Salad with Brussels Sprouts is a delicious vegan and gluten-free recipe. Roasted vegetables get a flavor kick when served with a sauce made from fresh herbs and salsa verde. Enjoy it as a side dish or make it a meal by serving this salad over quinoa. Often when I’m not sure what to do with the vegetables I’ve bought, I turn to roasting. Even when you keep the ingredients simple, the flavors achieved are delicious. Some of my favorites are Roasted Breakfast Potatoes, White Wine Roasted Vegetables, and Brussels Sprouts and Butternut Squash. But until now, I never thought to add a dressing to the roasted vegetables and enjoy them as a warm salad. It’s so delicious as a side with some Potato Tacos or over a bed of Cilantro Lime Quinoa. 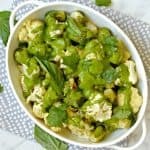 The base of the sauce for this Warm Cauliflower Salad with Brussels Sprouts is salsa verde, or green salsa. I usually use store-bought salsa, either in a bottle or from the refrigerated case. But if you have time to make your own, I highly recommend it. It really doesn’t take much effort and only requires a few ingredients. If you’re interested in making salsa verde yourself, try this recipe from Mexican Food Journal. Otherwise, all you need to do to make the sauce is to throw your ingredients in a high-speed blender and blend until smooth. The sauce is similar to a pesto or pistou with fresh herbs, lemon juice, olive oil, and nutritional yeast. In addition to traditional fresh basil, I added fresh cilantro which compliments the green salsa. But if you don’t care for cilantro, try fresh Italian parsley instead. Making Warm Cauliflower Salad with Brussels Sprouts only takes about 30 minutes. Simply roast the vegetables in the oven at a high temperature until slightly browned, then drizzle with the sauce when you’re ready to serve. If you have leftovers, you can either heat them or enjoy them at room temperature. Warm salads are perfect during the winter when you may not feel like eating a cold salad. This Warm Cauliflower Salad is really healthy and loaded with potassium and vitamin C.
It’s also high in vitamin A, iron, and calcium. In addition, cruciferous vegetables like cauliflower and Brussels sprouts are low in calories, high in fiber, and keep you feeling full longer. Now let’s make Warm Cauliflower Salad with Brussels Sprouts! Roasted vegetables get a flavor kick when served with a pistou made from fresh herbs and salsa verde. Enjoy as a side dish or make it a meal by serving this salad over quinoa. Toss the cauliflower and Brussels sprouts with the olive oil and salt. Spread the vegetables out on the baking sheet in a single layer. Roast until the vegetables begin to brown, about 15 to 20 minutes. Remove the vegetables from the oven and allow to cool for about 5 minutes. Add the sauce ingredients to a high-speed blender. Blend until smooth. To serve, place the vegetables in a serving dish and drizzle with the sauce. This recipe was adapted from Blistered Brussels Sprouts and Cauliflower by Chef Eduardo Ruiz.